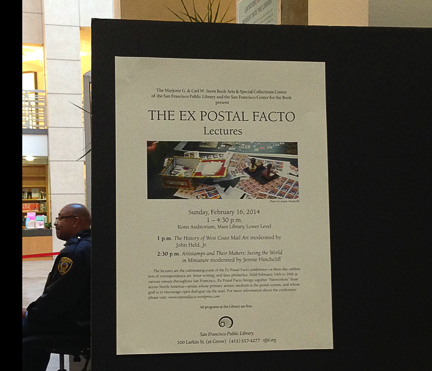 Fantastic news, everybody: the Ex Postal Facto lectures hosted by the SF Public Library are live and direct! The first lecture of the day was titled “A Brief History of West Coast Mail Art”. John Held Jr. led the panel discussion featuring Anna Banana, Leslie “Creative Thing” Caldera, Carl Chew, and performance artist Lowell Darling. It was both a great introduction to the west coast “scene”, as well as wonderful storytelling by each panelist. “Artistamps and Their Makers: Seeing the World in Miniature” was the afternoon’s second lecture. Perforations, postmasters, and the particulars of stamp design were covered — moderator Jennie Hinchcliff spoke with Black Rock City Postmaster James Cline, artistamp makers Ginny Lloyd, James Felter and Harley of Terra Candella in a lively discussion. The Ex Postal Facto organizers would like to extend their enormous thanks to the SF Public Library for hosting these lectures, as well as the A/V department at SFPL for editing (and making available) these wonderful videos. Both lectures were sponsored by the Marjorie G. and Carl W. Stern Book Arts & Special Collections Center.